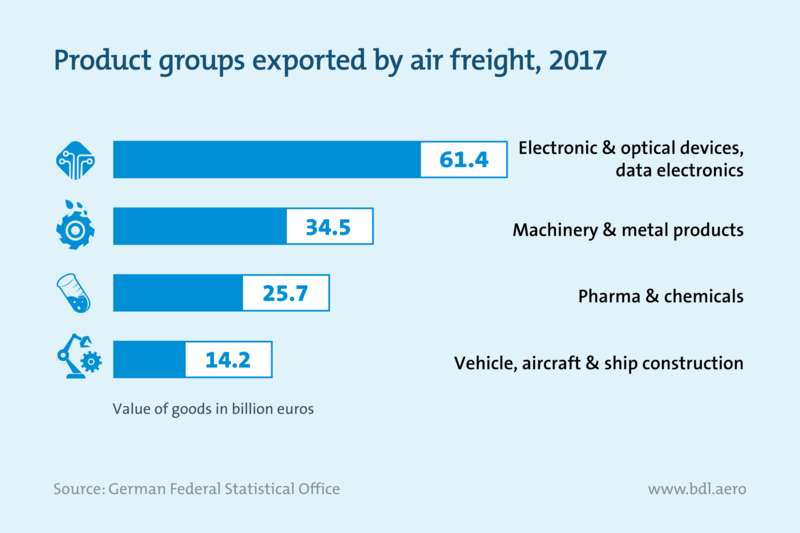 Aviation connects Germany as a business location with international markets: air freight transport links the German economy to global flows of goods, and business travel enables companies to maintain contacts with customers and suppliers. The economic significance of aviation goes far beyond employment in our companies, because air cargo connects Germany to global production and supply chains around the clock. It enables companies to transport time-sensitive and perishable goods quickly and safely all over the world. A large proportion of trade with overseas countries – in America, Asia, Africa, Australia and Oceania – takes place by air. In 2017, aircraft transported goods worth €260 billion in foreign trade with overseas countries. Of this amount, €156 billion was accounted for by exports and €104 billion by imports of foreign products to Germany. In terms of volume, only a small proportion of goods were transported by air, but the value share of exports transported by air accounted for around 31 percent of total overseas exports. The figure for imports was as high as 37 percent. Airplanes are mainly used to transport particularly high-quality and time-sensitive goods for which land or sea transport is not an alternative: for example, machines, spare parts, vehicle parts, etc. 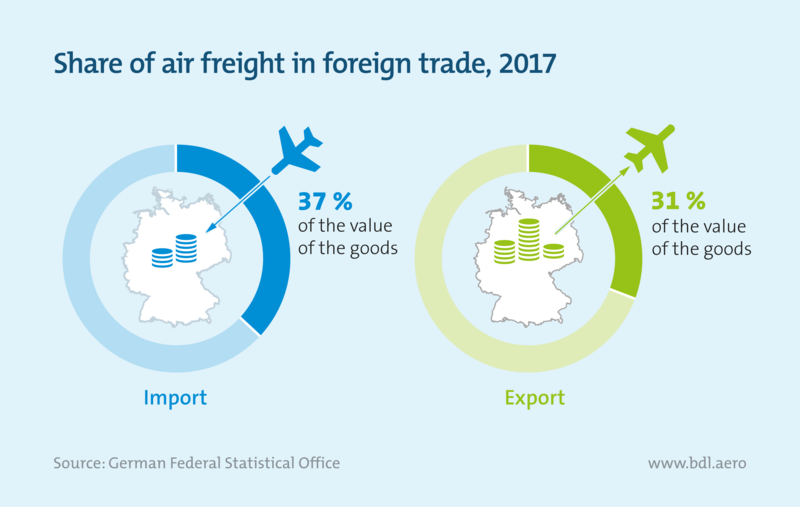 The official foreign trade statistics of the Federal Republic of Germany show that goods from German core industries in particular are transported by air cargo – i.e., goods from those sectors that lead to many jobs and a large part of the value creation in Germany. Perishable and temperature-sensitive goods such as medicines, blood preserves and organs are also preferably transported by air, as this allows interruptions in the cold chain, for example during reloading, to be kept as brief as possible. Not only for industrial enterprise but also for retail and online businesses, air freight is of outstanding importance, which end customers usually do not even notice. More than 90 percent of all smart phones in Germany, for example, are transported to the country by air. Freight is not only transported in cargo craft: almost 50 percent of the goods are shipped in the lower decks of passenger planes. Freight and passenger traffic are therefore closely linked and interdependent. 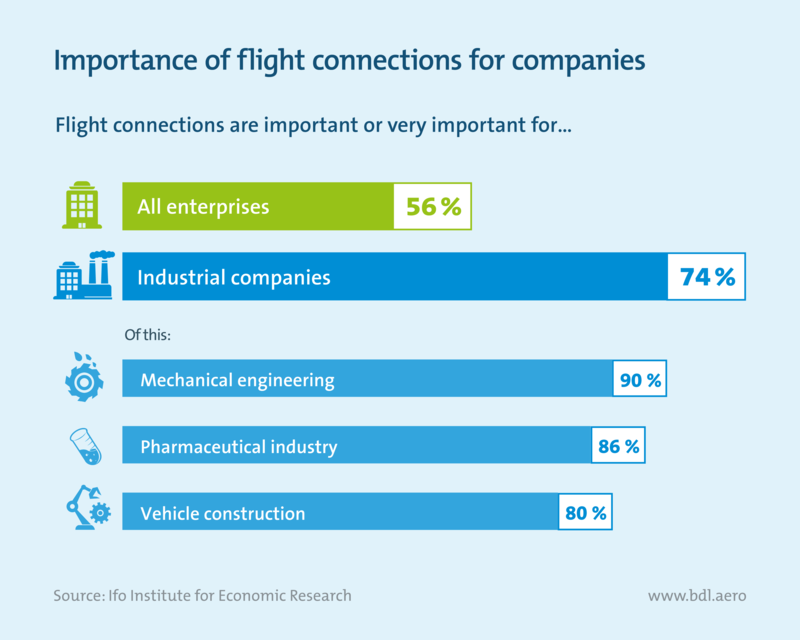 Data from the Ifo Institute for Economic Research show how important a good connection by air is for companies. The institute interviewed about 7,000 German companies from industry, trade and the service sector about the importance of flight connections for their economic success: for 56 percent, flight connections are of great or even very great importance. In the industrial sector, as many as 74 percent of companies surveyed stated this. Air transport is regarded as particularly relevant in the core sectors of German industry – mechanical engineering, pharmaceutical and vehicle manufacturing companies – which account for a large proportion of Germany’s export power.